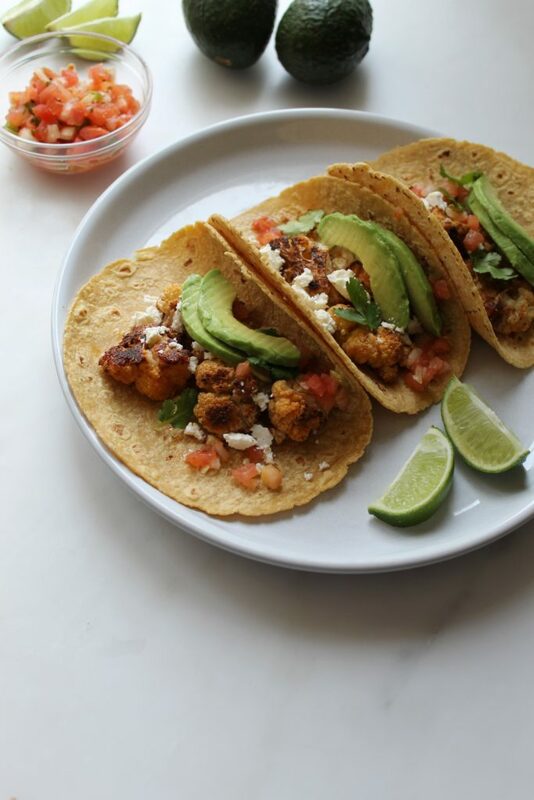 These Mexican spiced cauliflower tacos are SO delicious. I love them for a weeknight meatless meal. Spring is just about to arrive here in Toronto and I’m craving a little more yoga, sunshine and vegetables. 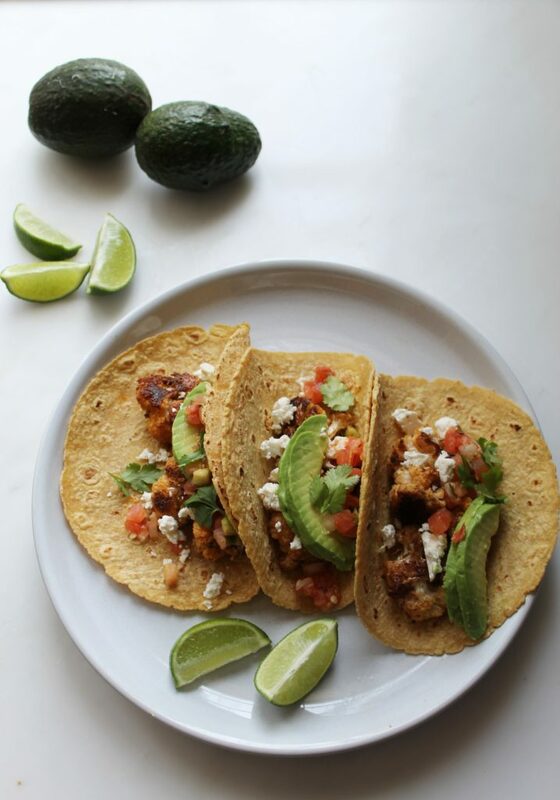 I roast the cauliflower and stuff it into soft corn tacos and top with avocado, feta cheese, fresh salsa, lime and cilantro. But the cauliflower is amazing on its own too as a side dish, or on a grain bowl. Hope you love it! Heat your oven to 400 degrees. Mix the oil and spices with the salt and pepper in a small dish. Line a baking sheet with parchment paper. Wash and chop the cauliflower. I remove the core and then break apart the florets. 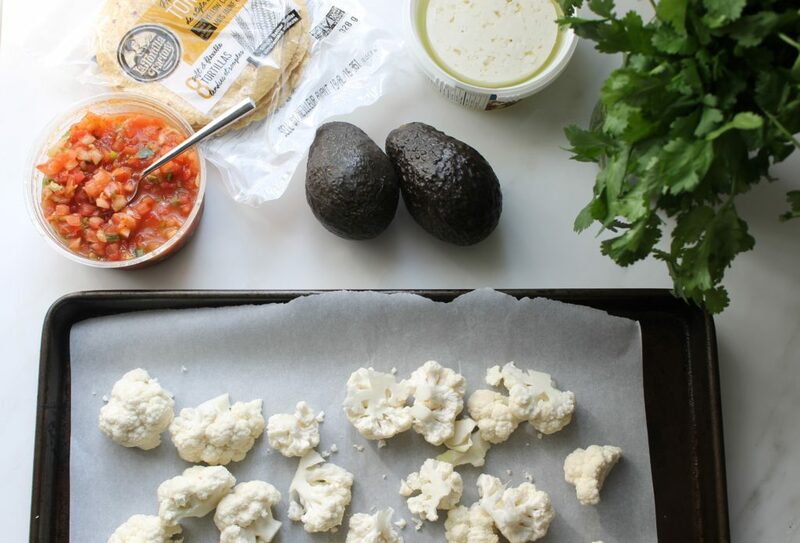 Throw the cauliflower pieces on the baking sheet and drizzle with the spice and oil mixture. Roast for 25 minutes. Flip the cauliflower pieces over and stir it around halfway through the cooking time to get all the pieces equally crispy. Dunking a grilled cheese into a warm bowl of soup is my comfort food and reminds me of my childhood. (Tomato soup 100%!) 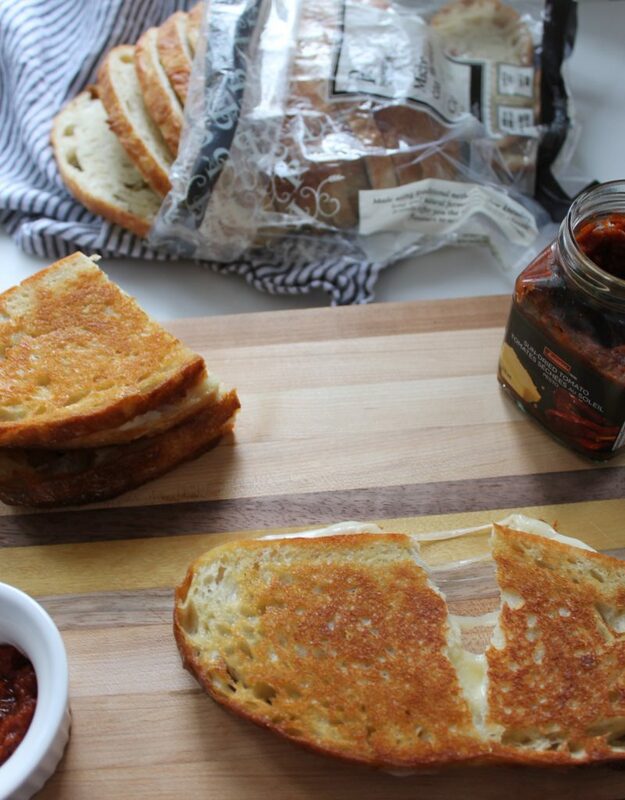 I love making grilled cheese over March Break or a winter weekend. But I have growing boys and I cannot stand at the stove flipping for an hour. 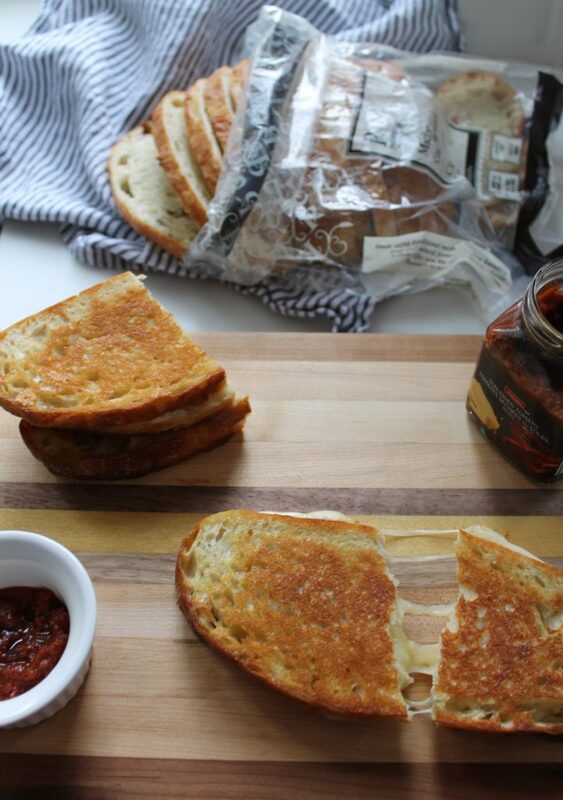 Enter the sheet pan grilled cheese! 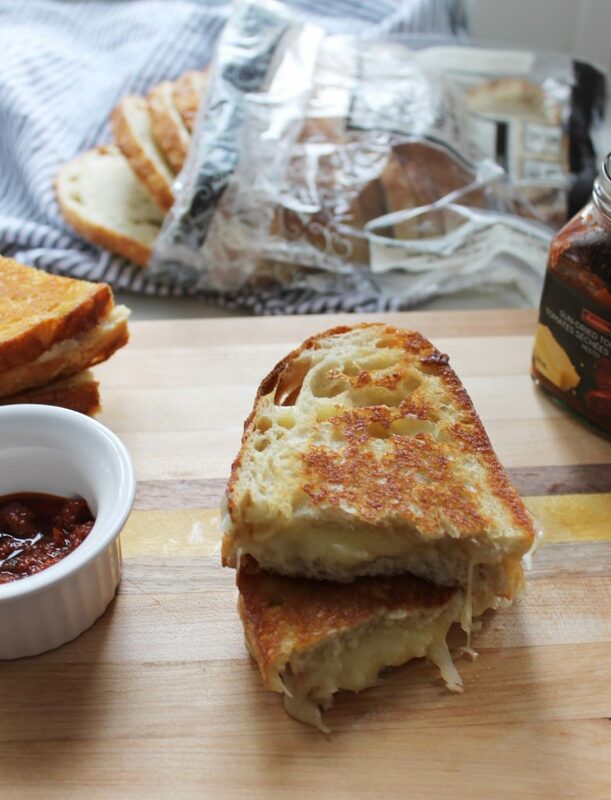 Hot oven for ten minutes and perfect grilled cheese every time. I used Premiere Moisson bread available at Metro grocery stores and a combination of asiago, cheddar and mozzarella. But you can use any cheese combination you like. This Premiere Moisson bread is becoming a staple in my house because it’s natually fermented, made using slower traditional methods, and has no sugar or preservatives. I always keep a loaf in the freezer for toast or grilled cheese cravings. The whole wheat and country-style loaf are our faves. Try the recipe and let me know what you think in the comments or on Instagram! Makes four grilled cheese sandwiches. Another tweak I love to do is layer roasted red peppers and zucchini inside with the cheese – a way to get more veggies and also tastes delicious. Thank you to Metro for supporting this post! I sometimes work with companies and sponsors, but only those I actually enjoy eating in my own kitchen, promise. Meet my best roasted chicken ever. I am on a serious winter cooking kick. 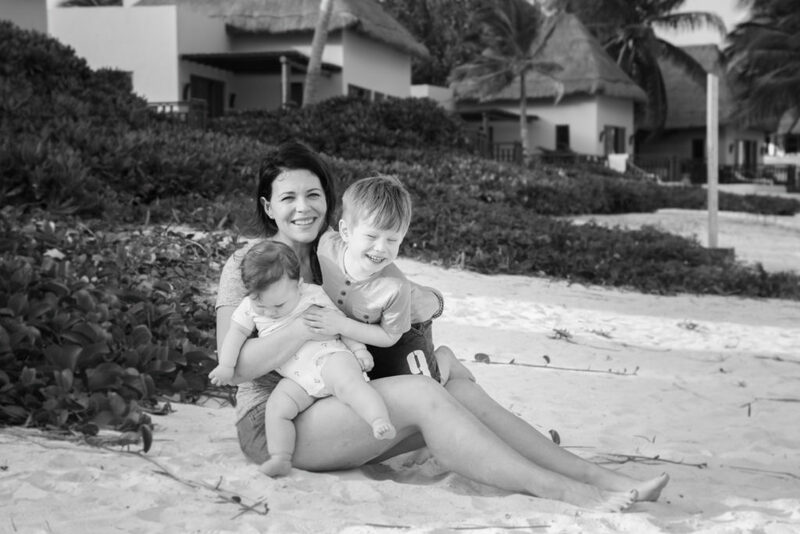 We got home from Mexico about two weeks ago to lots of snow in Toronto and I’ve been cooking and trying to catch up on laundry ever since. I’ve made this yogurt-lemon-garlic-thyme roasted chicken twice in the time we have been home and it is probably the most moist and flavourful chicken I have ever had. I love it. Something about the garlic, lemon, yogurt combination quickly brines the chicken and packs so much flavour. The plus of cooking a whole chicken? So much cheaper then buying pieces of chicken and you have leftovers for days (leftovers = my happy place). How did I get the idea for this? 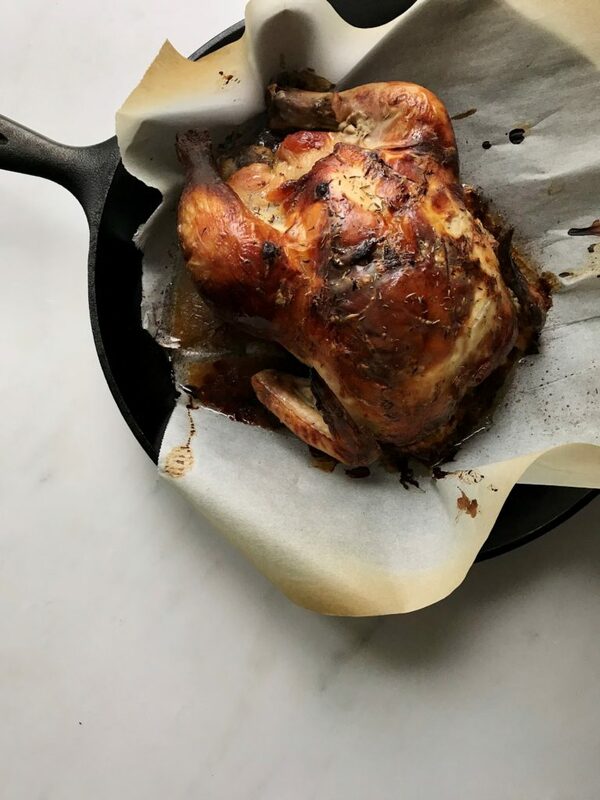 When I was waching Salt Fat Acid Heat and saw how Samin Nosrat marinated her chicken in buttermilk for 24 hours before roasting and it turned ino the most gorgeous brown tender looking chicken ever, I knew I had to try it. I don’t have buttermilk on hand usually, but I do have plain full fat yogurt and lemons as staples and it worked amazingly well. Generously salt and pepper the chicken on both sides and set on a plate. Combine the rest of the ingredients in a large plastic freezer bag. Be sure to squeeze all the juice out of the lemon and and throw the actual lemon in the marinade as well (more flavour). Put the raw chicken in bag with the marinade and rub it all over the chicken and set in fridge for 24 hours minimum. I always marinate for 24-36 hours and the flavour is so much better if you can do it. Quck note, plastic freezer bags rarely leak but I always place it on a plate in my fridge underneath it as no one wants raw chicken spilling. Preheat oven to 400 degrees. I like to line my cast iron pan with parchment and cook the chicken in that. But any oven safe dish will work if you don’t have a cast iron. Let chicken come to room temperature by sitting on the counter for 15 minutes. Place chicken on parchment lined pan and roast for 30 minutes at 400. After the 30 minutes is up reduce oven temperature to 350 and roast for another 60 mintes. So that’s 90 minutes of total roasting: first 30 minutes at 400 degrees and then 60 minutes at 350 degrees. Your house will smell divine at this point too. When time is up and chicken is brown and crispy remove chicken from oven and let rest ten minutes before tearing into it. I almost always steal a wing or drumstick at this point for my efforts. Hope you enjoy the recipe, friends and stay warm! 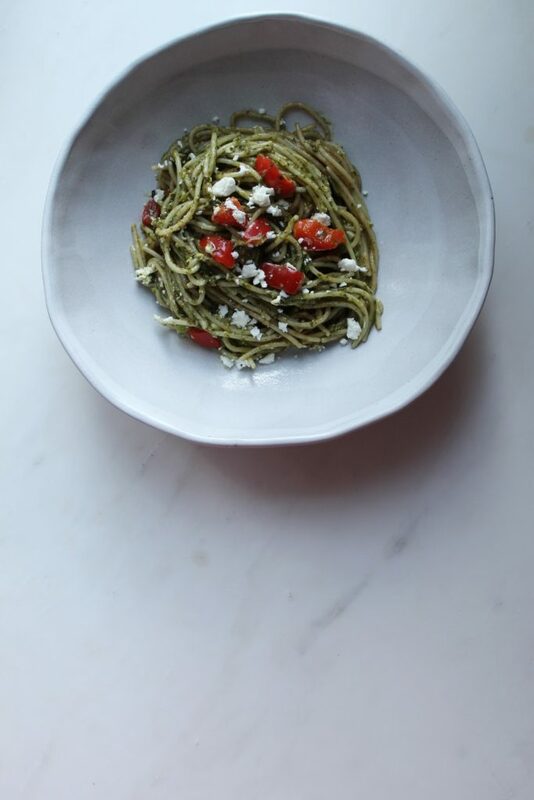 Zucchini noodles, brown rice pasta, pesto, plus a red pepper and a few pantry staples can cobble together a beautiful little pasta dish. This recipe is packed with vegetables (yay nutrients in cold season!) and flavor, plus it is gluten free and I love how simple it is. A bowl of pasta on a January night makes me so happy. I have started buying spiralized vegetables when I grocery shop and they are a huge time saver with two little ones, having a prepped vegetable ready to go. We are actually eating more vegetables (in pastas or rice bowls) because of it. Okay, back to the recipe! I love to make it with red pepper and zucchini, but you could also use baby spinach or swiss chard instead of zucchini noodles; or mushrooms instead of red pepper, just follow the recipe and sub in those veggies. I use brown rice pasta but you could use any type of pasta you like. I love using fusilli or spaghetti because it curls and blends so beautifully with the spiralized zucchini. To estimate the amount of pasta here is a great trick, if the recipe calls for 200 grams of pasta, just look at the grams listed on the package when you open it and eyeball it. For example, my pasta box said 450 grams so I knew 200 grams would be approximately half of the package. Hope you enjoy the recipe, send me a little note on Insta or in the comments if you make it. Recipe serves four generous portions. Happy winter cooking! Fill a large pot of water to boil, salt well and cook pasta according to package directions. Heat oil in a large skillet/frying pan. Add garlic and cook for a minute until fragrant. Add red pepper and cook until pepper softens slightly. Add the zucchini noodles to pan (be sure to NOT include the liquid from them, it makes the sauce watery) and generously add salt and pepper. Saute the vegetables for ten minutes. Stir in the pesto and balsamic vinegar being sure to scrape up everything in the bottom of the pan and sides. This will create the sauce for the pasta. Add the cooked pasta to the pan and toss to combine. I have a large frying pan that can hold all the pasta. If yours is too small put the pasta back into the empty pot you cooked it in, and pour the pesto and vegetable mixture over it. 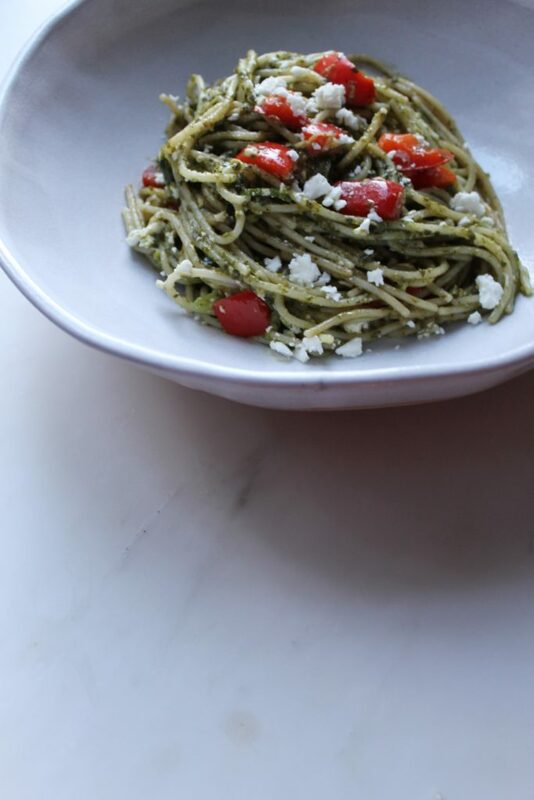 Use tongs to combine the pasta with the pesto. I like to add some of the cheese now so it melts a little bit. Taste for salt and pepper. I usually add a little bit near the end. Serve with extra cheese sprinkled on top. This is my go-to salad for guests. So simple and so good. I’m hosting a big family meal on Christmas Eve and plan to make a batch of this. I love a salad on a holiday table to lighten things up. 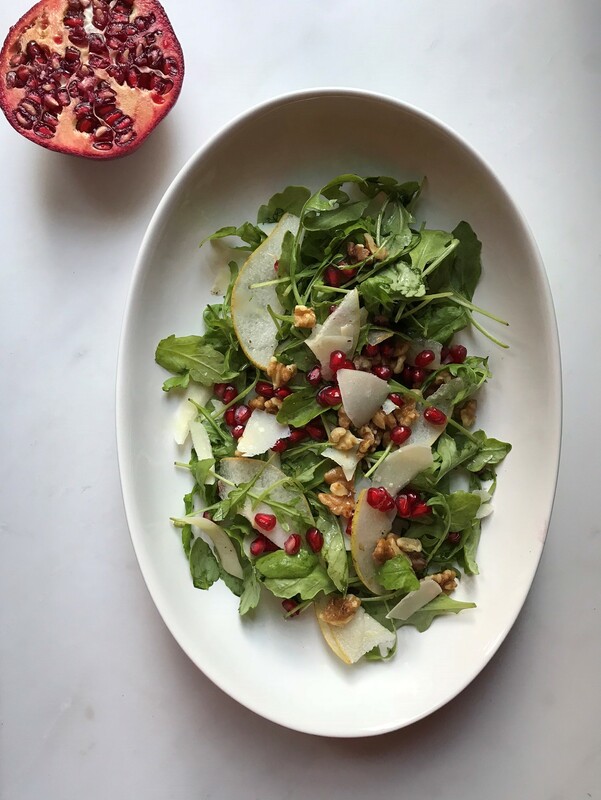 The bitter arugula plays so well off the sweet pear, salty parmesean, walnuts and lemony dressing. I will often toss this all in a big white bowl to show off how pretty it is. This is how salads should taste to me, hearty, satisfying with every mouthful leaving you wanting another. Salad pairs well with any grilled meats, or as a standalone lunch. Hope you love it as much as I do. Whisk the dressing together. Mix the salad ingredients. Toss and serve. Bonus points – dressing can be added 30 minutes before serving with no fear of wilting. Recipe serves four to six.